Police dealing with four security alerts within 24 hours in Northern Ireland have said the latest alert in Lisburn was caused by a "crude device". A number of homes were evacuated in Rathvarna Drive while the object was examined. The alert has now ended. On Tuesday night, two pipe bombs exploded in Armagh city and two others were also found in an overnight alert in Rasharkin, County Antrim. 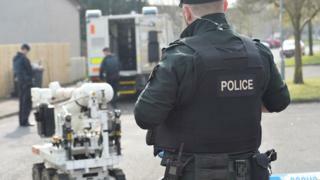 A separate security alert in Lurgan had been declared "an elaborate hoax". The Cornakinnegar Road in the town was closed between North Circular Road and Tarry Lane for most of Wednesday. Army technical officers removed a suspicious object from the scene. A large number of residents were evacuated from their homes and pupils from two local primary schools were affected by the alert. The Police Service of Northern Ireland said community safety had been their "primary aim". "The blame for the inconvenience, however, lies squarely with those individuals who left this close to a local school. They have absolutely nothing to offer local people or society in general," said Ch Insp Jon Burrows. In the Armagh city attack, three people were in a house in Windmill Avenue when the pipe bombs exploded at 23:30 BST, but no-one was hurt. Officers are working to establish a motive. In the Rasharkin alert, residents had to leave their homes in Moneyleck Park after the alarm was raised at about 22:00 BST on Tuesday. A pipe bomb had been set on the windowsill outside a house and a second bomb was thrown through a front window, police said. Residents were allowed to return to their homes on Wednesday morning.